Had one of those Maven/Eclipse experiences that was so infuriating, I need to record it here to make sure I can fix it easily next time. Using STS 2.9.1 I created a “Dynamic Web Module” project. For the runtime I targeted tc Server / Tomcat 6. Then I proceeded to do some rudimentary JSP stuff, only to find that the JSTL taglibs were not resolving. It seems the expectation is that these would be provided by the container. Under JBoss they probably would be, but not under Tomcat. (I guess it makes sense… if you have multiple apps in the container, just let each one bundle the version desired – fewer container dependencies). One or more constraints have not been satisfied. WTF? 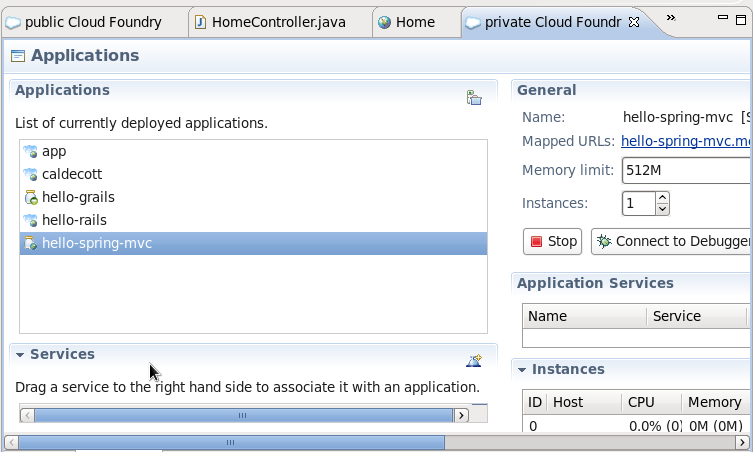 Of course STS/Eclipse are configured to use Java 1.6… but my project apparently isn’t. So I go change that, but it doesn’t fix that error, and any time I update project config with Maven, it’s back to using JRE 1.5 and my Java source files are no longer on the build path as source files. Turns out (took longer to find than to tell about it) the Maven compiler plugin doesn’t use Eclipse settings and just imposes its own defaults, i.e. Java 5, unless otherwise configured by a POM. 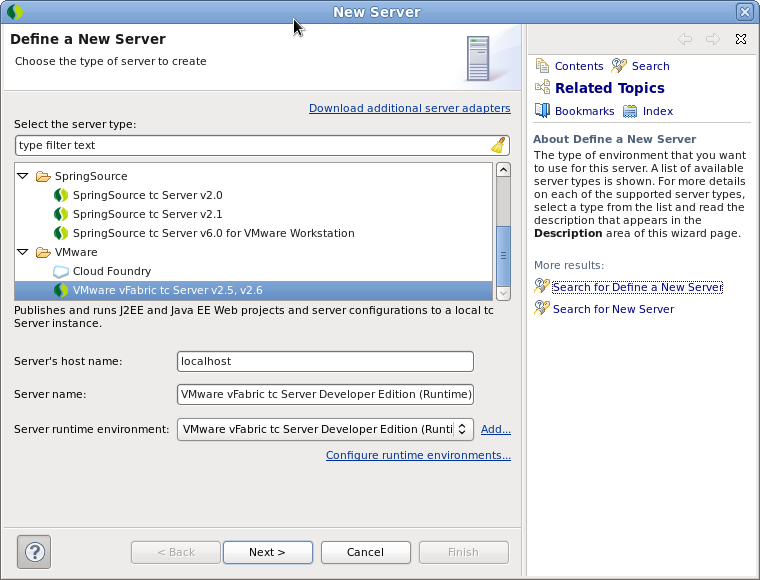 And since a “Dynamic Web Project” uses Servlet 3.0 it requires Java 6. Boom. Then have Maven update project config again and 1.6 is in play. Oh, and instead of using the “src” directory for my source, I went ahead and changed to src/main/java as Maven expects, so that future “config update” will pick that up. In my spare work time the last couple days I’ve taken another good look at Cloud Foundry. I haven’t gotten to the code behind it yet, just putting it through its paces as a user. I’ve used the public cloud as well as running the virtual appliance (Micro Cloud Foundry), and the CLI as well as the STS/Eclipse plugin. It’s really a lot easier than I expected to get up and going (even the Eclipse part). I guess that’s the whole point! The only trouble was that when I booted it up, I left the NIC at default config, which attaches it to a virtual network private to my workstation. I’d much prefer it available to my whole LAN, so I reconfigured it to bridge to the LAN. But then I had trouble getting MCF to accept its new address. It wasn’t clear how to do it – I don’t remember how I finally got it to work – something about offline mode. But eventually it accepted its new LAN address. The example with the simple Ruby application is indeed simple: just install ruby and rubygems (required for the CLI anyway and even instructions for that are included!) and the Sinatra gem, and follow the instructions. Rails proved to be a little more complicated, but mainly due to my setup. Rails 3.0 and 3.1 are supported. I had gem install Rails and got the latest: 3.2. It seems like this might work, except the simple app that you get with “rails new” uses coffeescript, which pulls in a native gem for the JS library, which can’t be bundled into the cloud app. The discussion at that link left me unclear how to remedy – remove the coffeescript gem? Wouldn’t that break stuff? Configure it to use a different JS lib via ExecJS? I wasn’t clear which, if any, of the options there wouldn’t have the same problem. Taking the path of least resistance here, I removed that rails gem and explicitly installed the most recent 3.0 instead. This highlights one of the difficulties with a cloud platform… native code. If your code requires something that isn’t abstracted away into the platform and framework, you’re out of luck. Theoretically, you know nothing about the native host under the platform, so you can’t count on it. Just one of the prices you pay for flexibility. Doesn’t seem to be routing that request, for some reason. It works fine if run with “rails server” naturally. Not sure what happened there, and didn’t want to mess with it just now. Moving on to Grails and Spring MVC, I quickly set up sample apps in STS and tried them out on both the private and public instance. No problems. The “Connect to Debugger” button only shows up for the app when I disconnect the debugger and need to reconnect. You might have noticed the “caldecott” app sticking out above. That’s actually a bridge app for accessing services from the cloud directly. With the caldecott rubygem, you can open a tunnel between the foundry service (say a MySQL DB) and a port on your local host, such that clients (such as mysqldump) can directly access that service at that port (e.g. to make a backup or restore one). That will come in handy. Also, just recently Cloud Foundry enabled running arbitrary workloads on the cloud (as long as they’re on supported platforms). It’s not just about webapps anymore! Another sweet development. Being a VMware/SpringSource project, STS comes with tc Server as a servlet container. There’s a server definition out of the box, but if you want to create your own, it is IMHO less than obvious how to do that. There’s no documentation specific to tc Server that I could find. And it seems to me that it would be even less obvious to someone that didn’t work for SpringSource and use tc Server all the time. So I thought I’d just walk through my understanding of the process, using my current setup (STS 2.9.1 on Fedora). For our purposes, it’s basically repackaged Tomcat. The supported package is a little more complicated, but to a developer, it’s not. It used to be SpringSource tc Server. Since the acquisition and re-branding, it’s VMware vFabric tc Server (making it a little harder to find in the dialog below). Since version 2.5 (the first re-branded version) it includes both Tomcat 6 and Tomcat 7. You can use either or both in the same installation. In fact, it’s possible to have more than one version of Tomcat 6 or 7 if you’ve upgraded an earlier installation of tc Server, but in this environment that’s probably uncommon. tc Server provides the means to define many server instances from one installation. Each has a separate instance directory (CATALINA_BASE) but refers to a shared installation CATALINA_HOME. This can be helpful if you want to try your application on multiple versions, clustered instances, with/without Spring Insight, etc. It will likely be helpful for you to peruse the documentation on creating a tc Server instance if you’re not already familiar. So with that in mind, let’s see what it’s like to “define a new server”, which is to say, a new server instance. The “New Post” link at the top of WordPress goes to a new post form devoid of useful options. Now why would WordPress want to make that the standard? Discovered today that some versions of Spring Insight (even developer version) wouldn’t deploy if the hostname it’s on doesn’t resolve properly in DNS. Doesn’t that describe most developer workstations? Version 1.5.1 doesn’t seem to have this problem though. I also got seriously derailed trying to change system appearance settings in Fedora. It really needs an “undo” button. And I spent a bit of time fiddling with STS trying to bend the tc Server instances to my will. There doesn’t seem to be a guide anywhere to what all the terms mean. I think I’ll write one up tomorrow or sometime. 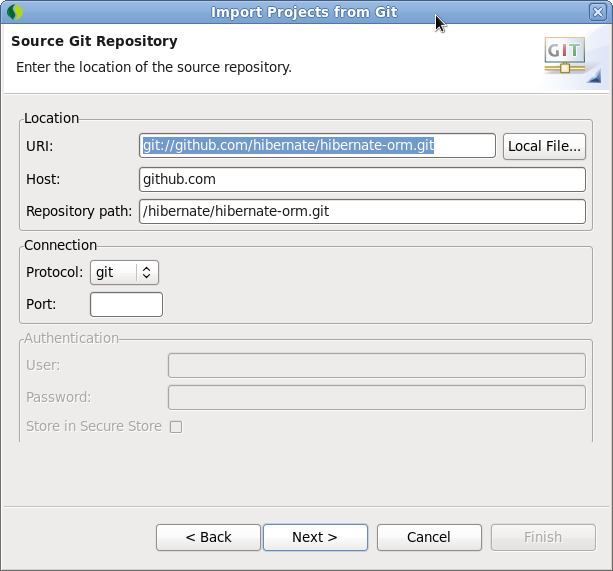 I have cause to revisit my post about importing a git checkout into Eclipse. 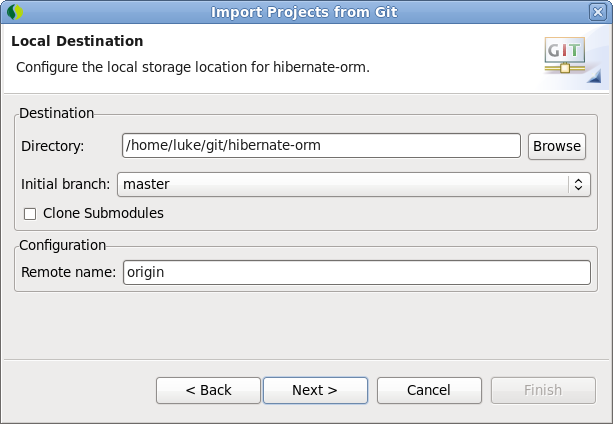 I need to take a look at the Hibernate code, which is on github at git://github.com/hibernate/hibernate-orm.git, and given the somewhat convoluted nature of this code, I need an IDE to help navigate it. Now, I hear that with Eclipse Indigo (3.7), which is included with the latest STS 2.9 (which is what I use), the EGit plugin is included out of the box (which, for the purposes of this post, is what I’m doing – completely stock install). That’s helpful. See, previously, if you wanted to do something with git, you would find no evidence within Eclipse that it could. If you figured “there must be an extension for that” and searched for “git” from the extensions wizard, there would be no hits. Because what you needed to look for was “JGit” or “EGit” – you big dummy. 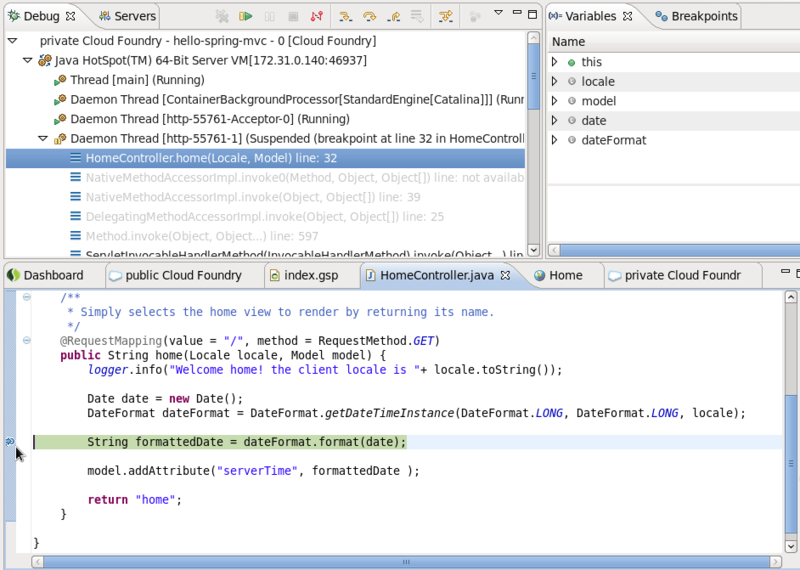 An example of what I consider low discoverability that’s pervasive in Eclipse/STS. But I digress. I’m not sure why it parses the URI into Host and Repository path here. Is there some reason you’d want to customize these? 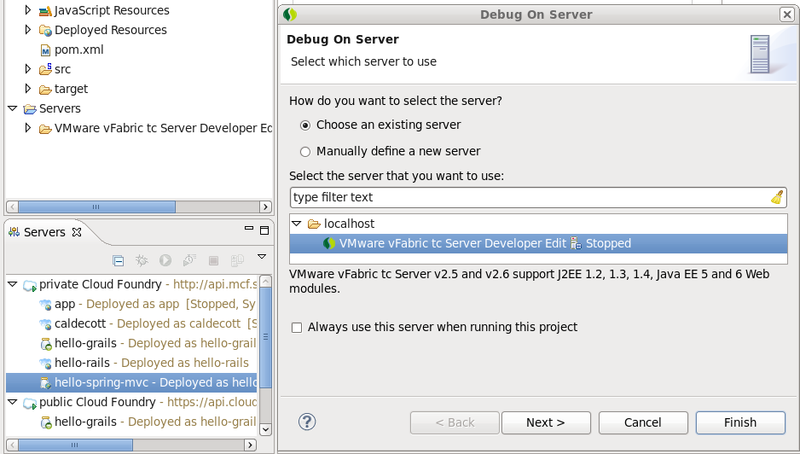 In the next step, I pick the branches from the repo I want and proceed to the “local destination” dialog. These steps might be somewhat confusing to those who don’t know git and just want to take a look at some code. Since git is distributed, you don’t just get a point-in-time checkout from a repo, you get your own copy of the repo – or as much of it as you want. Basically it’s asking where I want my copy of the repository and checkout to go. The checkout (“initial branch” here) will go in the directory, and the repo will go in a .git subdirectory. “origin” is the name given to the repository I cloned this from, in case I want to sync with that later. That might be kind of obvious to someone familiar with git, but how about some tips for those who aren’t? My question: why doesn’t this all simply default to being inside the workspace? What’s a workspace for, if not the project contents? As you can see, the default is to create a ~/git directory and checkout/clone the repo there. OK. These seriously need some explanation. What do these do? “Import existing projects” gets me nowhere in this case, as it requires Eclipse project descriptors to be included in the checkout, and they’re not. Arguably, they probably shouldn’t be. I just get the error “no projects found” if I try this. 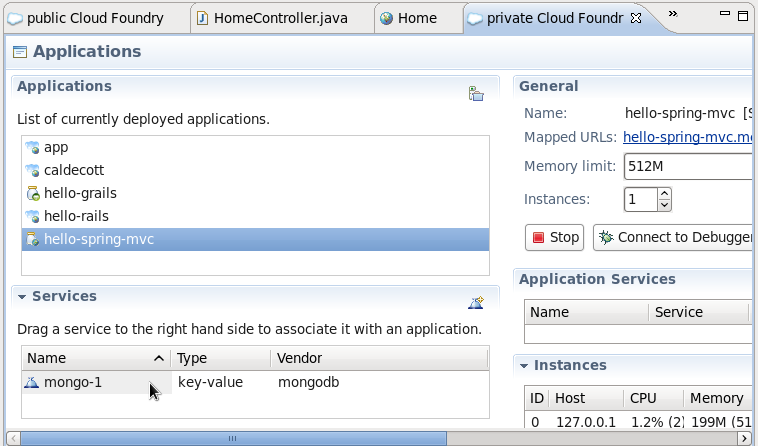 But that means I need to figure out myself how to get Eclipse/STS to interpret this checkout properly. 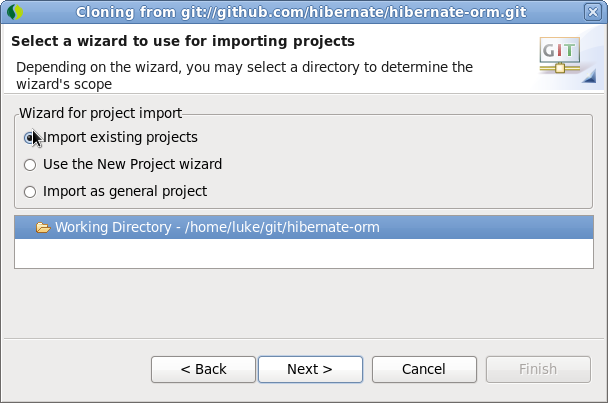 “Use the New Project wizard” is an option I don’t really understand. It just dumps you into the new project wizard you would get by clicking the new project button (generally the first button in the toolbar). This is also where you end up if you click “Finish” instead of “Next” anywhere along the way. I guess I could make use of the directory just created. I also can’t go “back” and choose another option from here; cancel, and I’m back to square one. In general, I find the “New Project wizard” one of the most confusing things about Eclipse/STS, because there are so many options, many sounding similar yet meaning something completely different, and no explanations of what you can expect to get. Do I really have to go looking for doc that should be a click away? I digress. “Import as general project” basically just creates a project with the given content and no organization. STS recognizes the different file types, of course, but there’s no concept of where the classpaths begin, how to build and test the project, anything like that – just plain directories with content. This won’t get me to my goal, which is to be able to look up class hierarchies, implementors of interfaces, etc. However, having done this, I can try to configure the project to get it to where STS understands these things. I’m interested in the 3.6 branch of Hibernate, which is a Maven project (you can tell from the pom.xml – woe betide you in the Java world if you don’t recognize Maven when you see it. The “master” branch seems to be using Gradle). 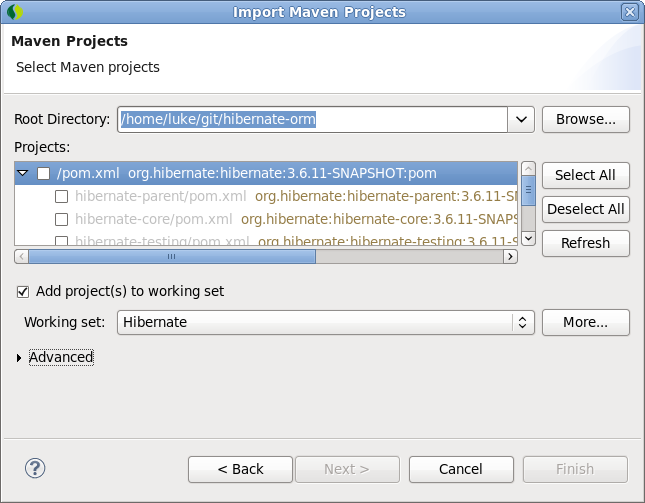 So I can right-click the project and Configure -> Convert to Maven Project. 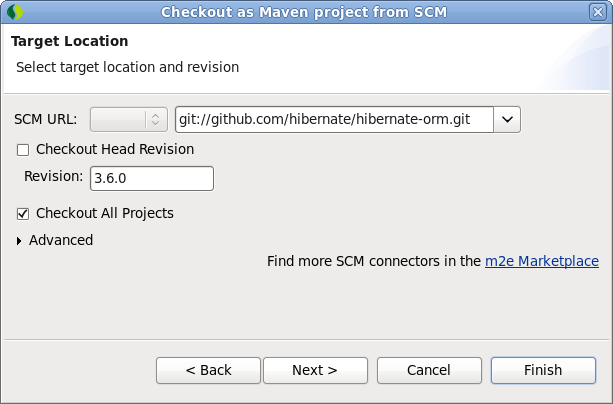 By the way, let me point out something that didn’t work at all: creating a new project with the wizard “Maven -> Checkout Maven Projects from SCM”. This is apparently not aware of the EGit plugin, because there’s no SCM protocol listed here (the first box is greyed out). If I click “Finish” here nothing happens except the dialog exits. I think it would probably work if I added a m2e SCM connector like the link suggests, but how would I know to do that? Alright, so now I have a Maven project. Right away in the top-level pom.xml I get a “Project build error: Unresolveable build extension: Plugin org.jboss.maven.plugins:maven-jdocbook-style-plugin:2.0.0 or one of its dependencies could not be resolved: Could not find artifact org.jboss.maven.plugins:maven-jdocbook-style-plugin:jar:2.0.0 in central (http://repo1.maven.org/maven2)”. I happen to know what this is about because I know there are a bunch of JBoss dependencies not in Maven Central. How would I know that if I didn’t know? Google, I guess. Fortunately searching for that exact error message gets me right to a StackOverflow question about exactly the same thing, which someone has helpfully solved. I love SO, I just hate that it has to exist. Documentation is always about how to use something the right way, not what to do when something goes wrong. SO fills that gap. But here’s another StackOverflow suggestion. This seems to work, after removing the existing commons-logging dependencies and adding those ones in the parent pom, and (finally) right-clicking on the project, Maven -> Update project configuration. The errors are gone, and (I suspect) so is all the Maven-fu I can expect today. Unfortunately I’m still not at my goal – I just have the Maven nature working now. Turns out, this wasn’t quite the right path. What I’m looking at here are multiple Maven projects, with interdependencies. There’s no way I’m ever going to get anything useful from this in a single STS project. What I need to do is import these as multiple projects. In the meantime, delete the existing project (but leave the checkout) so it doesn’t get in the way. If I select all the projects, they’ll all be created as interdependent workspace projects, each with build path and so forth configured according to Maven. With lots of errors, of course… thousands, in fact. But let me start with the Maven problems, which are probably the source of the rest. Looks like all of the Maven errors are of the form “Plugin execution not covered by lifecycle configuration: org.jboss.maven.plugins:maven-injection-plugin:1.0.2:bytecode (execution: default, phase: compile)” – with a different plugin each time. I remember the import screen warned about some problems that would need to be resolved later – this seems to be what it was talking about. Well, much later now, I think the Maven errors were mostly irrelevant. Those were due to the change to the m2eclipse plugin which broke the world for a lot of Maven users in Eclipse. Most of them were things that looked like it was safe to have m2eclipse “ignore” as recommended there. I went ahead and ran some of the goals that looked important (antrun:run and injection:bytecode in hibernate-entitymanager, the latter in hibernate-core) from the command line. Not sure they made much difference. I did Maven -> Update Project Configuration on everything changed and most of the red X’s went away. I also ran into this problem and crashed a few times just by mousing over the “Window->Browser” menu before adding “-Dorg.eclipse.swt.browser.DefaultType=mozilla” to my STS.ini to avoid it. … and then goes on to use these classes with underscores, which aren’t there. Evidently they’re supposed to be generated at some point, but I’m not sure how. I don’t really care about running these tests, just wanted to look at the framework code, so although STS reports 14382 Java problems, I can consider my work done here. Boy, that was easy! One more note: I went back and added the git SCM connector for m2eclipse to try it out. It worked… but poorly. The way that worked was to select “git” for the scheme, then put in the git:// URI for the project, then wait for a popup to select the projects to import. If I reversed order or didn’t wait, I got either an error or nothing after hitting “Finish”. Hmm… hope that’s better in the next update. And, interestingly… the checkout/repo went into the workspace. Google’s not helpful. Looking at the source of SortedResourcesFactoryBean doesn’t display any evident source for the problem. Guess I’ll ask on the Spring forum and see if I can find out anything. For all I know it’s an STS bug with 2.5.1; this exact same code and setup worked before, in an earlier version of STS. But it’s probably something related to the environment, perhaps the JARs I happen to have available via Maven. Just more examples of commonplace Eclipse/Java things that drive me nuts. I should say up front that the version of Eclipse I’m using is actually SpringSource Tool Suite (STS) version 2.3.2.RELEASE, running on the 1.6.0_20 64-bit Sun HotSpot JVM on Fedora 13. There’s a trove of Spring sample projects over at https://src.springframework.org/svn/spring-samples/ – very helpful. So I had Eclipse check some out and import them as projects. Funny thing, there seem to be a lot of complaints about XML. I’m getting a little more savvy, let’s see if I can resolve these. From petcare’s servlet-context.xml, we get the good old “Referenced file contains errors (http://www.springframework.org/schema/petcare/spring-petcare-3.0.xsd).” OK – I’m pretty familiar with that. If you try to go to the URL given, SpringSource’s server redirects you to the home page. Seems the “petcare” schema just didn’t quite make the list with the rest of the framework – I can understand that. But what URL should we use instead? Well, not surprisingly, the petcare projects contains its own XSD; it’s in /src/main/resources/org/springframework/samples/petcare/util/config/ – so how do I use that as the URL? Well, one way is to use the svn tree from the website; then the schemaLocation is https://src.springframework.org/svn/spring-samples/petcare/trunk/src/main/resources/org/springframework/samples/petcare/util/config/spring-petcare-3.0.xsd. Would have been nice if the project just did that, wouldn’t it? I would think that, distrusting SpringSource not to move/change it again, you could refer to it relative to src/main/resources/META-INF/spring/appServlet/servlet-context.xml as ../../../org/springframework/samples/petcare/util/config/spring-petcare-3.0.xsd (feeling the pain yet?) or copy it to the same directory and just refer to it as spring-petcare-3.0.xsd – but neither of these seems to work on deploy, while the web URL does. There’s a file META-INF/spring/spring.schemas that appears to be intended to specify where to look in the project for the schema, but I’m not sure how it’s supposed to be referred to in Eclipse to make this work. Here’s a really great error Eclipse has on one of the XML elements that refers to the schema: “- schema_reference.4: Failed to read schema document ‘spring-petcare-3.0.xsd’, because 1) could not find the document; 2) the document could not be read; 3) the root element of the document is not <xsd:schema>.” So which is it? Good grief. Would it really be hard to make messages like this actually useful? This is so frustrating. Amazingly enough, if you try to deploy and you haven’t cleaned this up, Tomcat goes and tries to download the XSD as well and fails if it comes out wrong. So there you have it: your ability to deploy seems to depend on whether the right web sites are up at the right time. I imagine there’s a Tomcat or context.xml setting to disable this behavior. OK. So now I’m pointing at the right XSD, but I still have problems with servlet-context.xml. Actually it’s only a warning, but: “Unable to locate Spring NamespaceHandler for element ‘petcare:resources’ of schema namespace ‘http://www.springframework.org/schema/petcare'&#8221; – again with the “Unable to locate” business. That crap sure gets old. Why don’t you give me some kind of clue? Where did you look, where should I look? Actually I think I understand this and it’s trying to say there’s no “resources” element defined in the XSD. But there certainly is, so I don’t really know what this is on about. It seems to work anyway on deploy so I’ll ignore for now. This has the warning “Validation warning occured in imported configuration file ‘src/main/resources/META-INF/spring/security.xml'”. Yes, as it turns out that file has errors on lines 22 and 24, where they make a lot more sense. But they’re not reported in security.xml; they’re reported against irrelevant lines in root-context.xml, which just includes it. Truly mind-boggling. Now from this, plus the “Build path is incomplete. Cannot find class file for org.springframework.samples.petcare.util.templating.DefaultStringTemplateFactory” on line 29, I gather the build path is incomplete. But all those files look to be provided by this project and the build paths seem to be set up fine. So what the heck is going on? At this point I checked my system and noticed that after installing some unrelated things, Fedora has chosen java-1.5.0-gcj as my compiler. I don’t think Eclipse is using this, and theoretically it shouldn’t matter anyway, but I shut down Eclipse, reconfigure alternatives so the Sun JDK is again providing the default javac, restart Eclipse, and clean the project. Somewhere in there, the complaints went away. Line 62 is a completely innocuous HTML div. Eclipse is just bonkers. I delete the marker and now my petcare project is free of red Xes. I deploy and it works. That might be enough for some people… but now, what about all those warnings? Our old friend servlet-context.xml still has a warning next to <petcare:resources> that says “Unable to locate Spring NamespaceHandler for element ‘petcare:resources’ of schema namespace ‘http://www.springframework.org/schema/petcare'&#8221;. I feel I’ve been as clear as possible about the petcare schema so I really don’t know what more there is to say. So let’s leave that (or delete it). Under src/main/resources, log4j.xml complains “The file cannot be validated as the XML Schema “/home/luke/Documents/workspace-sts-2.3.2.RELEASE/petcare/src/main/java/log4j.dtd (No such file or directory)” that is specified as describing the syntax of the file cannot be located.” This seems to be universally ignored – as I recall, I saw some bogus explanation as to why it was bad to specify a URL for this DTD. You would think Eclipse could just supply the DTD itself, or find it somewhere in the log4j JAR in my Maven dependencies. I don’t have a clue what to do about this so I leave it. The final warnings are in src/main/webapp/WEB-INF/views/appointments/calendar.jsp, where Eclipse is complaining about data-* attributes on some HTML tags. As I recall these attribute “extensions” are part of the HTML standard so I don’t know why Eclipse is complaining. No way to shut it up without disabling validation entirely, so again let’s leave it. And that’s it for petcare. BTW, petcare has a big fat memory leak in it somewhere, because after you’ve re-deployed a few times, you get a PermGen error. Nice going. I can use this to hone my memory-leak-debugging skills soon.